Shirley Mancino is renowned for her courageous exploration of mixed media and experimental techniques. A sought-after art instructor, juror and critic, she has won numerous prestigious awards for her art. 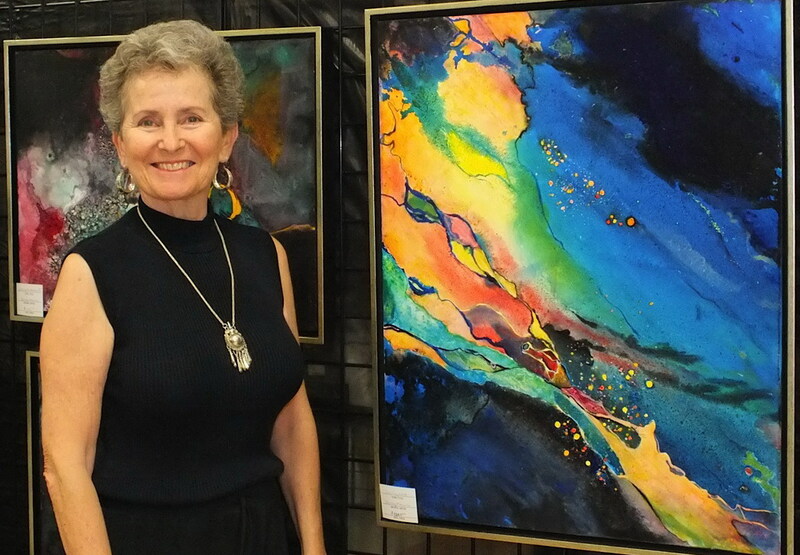 Shirley delivers art workshops and presentations in her studio and throughout North America. “She is one of the few good artists who can also teach what they do,” says a former adult instructor and one of her art students. Hello Shirley – Spending time on your website has been an inspiration to me. I have gone a year without painting and am now ready to pick up the brushes again. Your joy of painting and enthusiasm comes through on your website. Thank you so much for sharing! Good to hear from you Joan. Thanks for your positive feedback. Good luck with your new paintings. I really love to receive your emails, you are an absolute breath of fresh air . I love your paintings and your passion and really look forward to the day I can participate in one of your workshops (it’s high on my bucket list!. Please keep those emails coming. I love to receive them. Would you be interested in doing a demo? Thanks for the request Judy….I would love to do one next time I am in the area…that may be in a couple of years. This is wonderful Shirley. You are now – very fully! – in the world of social media. You never cease to amaze me! Love your first blog entry……actually think you were always adventurous but that the quality was perhaps circumscribed by ‘life stages’. Anyway, you’re definitely more adventurous now than the average bear! Look forward to more blogs. Thanks for the comments and for following me…now what about Skype. LOL! Hi Shirley: This is going to be “most” interesting” to keep up with your blogs and new paintings. Your paintings are very beautiful and only get better. I witnessed your talent at Delhi India – International Airport. You were sitting on the floor of Airport waiting area and your magical hands crafting a Rajasthani individual’s picture and I bet it looked better than the subject of the painitng. You are gifted and each one of your painting is a perfect execution of vision that is very rare to find. I am very proud to see your beautiful work and the privilege to know you personally. Wow Dave! Thanks for the beautiful remarks..I too remember waiting for a late plane at 1 A.M., sitting on the airport floor painting and meeting you for the first time…seems like only yesterday!…was it really 12 years ago? Love the website, Shirley. I always enjoy your paintings. Can you put names on the paintings so we can comment on particular ones? I love the woman/fairy and the girl carrying wares on wooden yolk particularly. Looking forward to your posts…a big commitment. Great website Shirley, easy to navigate and beautiful paintings! Thanks Sandy, I’m glad you like it. Thanks for your great feedback Darlene….follow my blog and I’ll try to continue to “be wise” or maybe just be adventuresome. Thanks Judy for watching my progress with my paintings and for commenting. Please email me with all your news.